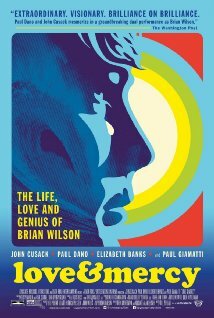 Movie Review: “Love & Mercy” is an American biopic about Brian Wilson, the genius behind the Californian surf-rock band formed in the 60’s, The Beach Boys. The film was directed by Bill Pohlad, producer of cinematic wonders such as “The Tree of Life”, “12 Years a Slave” and “Wild”, being his second feature in 20 years. The drama, intently written by Oren Moverman and Michael A. Lerner, stars the reputed Paul Dano and John Cusack, who play Wilson in his young and middle-aged phase, respectively. Their majestic performances are well backed up by the phenomenal Elizabeth Banks and the versatile Paul Giamatti, who proves how awesome he is, even when playing an evil character. The movie is well structured, shifting back and forth, and counterpointing the past occurrences with the actual state of the overmedicated musician whose guardian and therapist, Dr. Eugene Landy, tries to control his life, manipulating all his movements and assets. This situation will slowly change after Wilson falls in love with the helpful and lovely Cadillac saleswoman, Melinda Ledbetter. A lot of tenderness and understanding will come out of this special encounter, but never the following incidents are subjected to an overdramatic treatment or intemperance. As we watch the adult Wilson struggling to get back his mental balance, desperately writing ‘lonely, scared, frightened’ in a piece of paper, as if he was screaming for help, we also have the young one, giving wings to creativity while trying to gain the approval of his insensible father, and dealing with ‘the voices’ inside his head. Mr. Pohlad compels us to be engulfed at every minute in a story that starts being so depressingly sad, but drives us into a limitless hope. I was never enthusiastic of The Beach Boys, a fact that didn’t inhibit me from cheering this stupendous reenactment of its leader’s experiences. A wise casting brought the solidness needed to make the steadfast plot work.